Your dog's skin health provides a window to his overall well-being. The range of causes of dry skin in dogs runs far and wide. As such, every breed and age group remains susceptible to skin problems. Most at risk include very young, elderly, stressed or overcrowded dogs, or those with immune system problems. To effectively treat your dog's dry skin, you must first determine the root cause. Family taking dog to vet. Providing a balanced diet is crucial to your dog's skin health. Diets laden with cereal, fillers and artificial ingredients don't provide the essential nutrients your dog needs for healthy skin. Many ingredients in dog food such as beef, chicken, corn, wheat and soy cause allergic reactions in dogs, leading to dry skin. Your dog also may have an allergic reaction to the artificial colorings in his food, which can cause an unnatural immune system response. Discuss your dog's diet with your veterinarian. If necessary, switch to a hypoallergenic food or consider adding an essential fatty acid supplement to his meals. 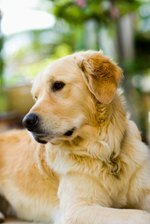 Fleas, a leading cause of dry, itchy skin in dogs, must be controlled throughout the year. While fleas thrive in warm climates, they can survive in colder climates, especially inside a warm home. Many dogs have allergic reactions to the saliva injected into their skin via flea bites. Dogs with more pronounced flea allergies require fewer fleas and flea bites to create skin problems. Maintain a flea control program year round that includes treatment for your home, your dog and your yard. Your dog naturally creates oils that moisturize his skin and coat. When you bathe your dog too frequently, or use products not formulated for dogs, you risk stripping his natural skin oils. The result is dry, flaky, itchy skin. Bathe your dog only when necessary, and no more than once per month. If you find yourself fighting doggy odor, try using a dry shampoo between baths. Use products specifically formulated for dogs. For extra relief, try adding vitamin E oil to his shampoo or bath water, or add finely ground baby oatmeal to warm water for a soothing soak. Many dogs develop skin problems in reaction to environmental allergens, such as dust, dust mites, mold, pollen, grasses and weeds. Work with your veterinarian to determine which allergens are causing your dog's dry skin and to develop a course of treatment for your dog. Ensure your home environment is clean and keep your house vacuumed. Avoid exposing your dog to exterior allergens whenever possible. Walk your dog only at times when allergens such as pollen or vehicle exhaust are lower. If necessary, your vet can prescribe antihistamines or corticosteroids to inhibit your dog's allergic response. He also may administer injections, which help desensitize your dog to allergens. Fungal and parasitic infections can create visible skin problems on your dog. Sarcoptic mange, caused by the Sarcoptes scabei mite, results in dry, itchy skin resembling an allergic reaction. Sometimes the skin will thicken and become gray in color. Fungal infections such as ringworm result in red, irritated skin accompanied by hair loss. Your veterinarian can recommend an appropriate course of topical treatment for your pet. Any other pets in the house also should receive treatment, since fungal and parasitic infections are highly contagious and spread easily.